Home Rethinking Value in Consulting: What distinguishes top performing consulting firms from the rest? Rethinking Value in Consulting: What distinguishes top performing consulting firms from the rest? This is a summary of an original ‘Point of View’ article by MCA Associate Member PSfPS. You can read the full article, including examples taken from the winning consulting firms, here. Why are some consulting firms seemingly able to maintain a healthy supply of new clients, run many successful engagements and attract the best people, when, at least on paper, their consultants appear to have similar levels of experience, knowledge and expertise as other firms? Rather than superior consulting tools or ‘solutions’, the success of a consulting firm is a direct function of its people. Not high levels of technical, functional or sector knowledge – that is par for the course – but superior human, emotional and cognitive capabilities: an ability to illustrate significant value in every single contact with the client. How consulting firms reward, encourage, share and embed these behaviours across the organisation is what determines the overall performance of the firm. “It ain’t what you do, it’s the way that you do it, and that’s what gets results” Value is not something created by a consulting tool, it is a judgement made in the client’s mind based on the experience of working with that consulting firm. See the full Point of View for examples from MCA award winning firms Integration Consulting, Egremont Group and PwC. Many consulting firms have well-known, often altruistic stated values but it is how these values are realised in every interaction with clients and colleagues that distinguishes the top consulting firms. See the full Point of View for examples from MCA award winners PPL and Arup. Knowledge and skills transfer is a prime example of how the top firms put their values into action. The reason is simple; by transferring their knowledge and skills throughout an engagement, consultants ensure the perceived value of their work is significantly enhanced in the client’s mind long after the project has ended. 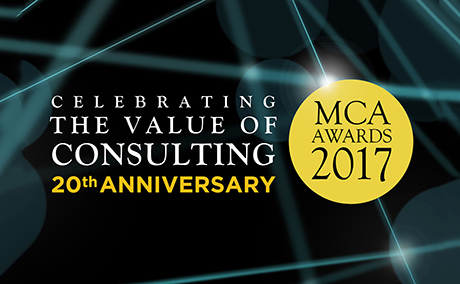 We did find some firms for whom outstanding performance predominantly came from the use of market leading or consulting tools – such as MCA award winning firm Pearson Ham Consulting. However, we would argue that firms whose key advantage comes from their proprietary consulting tools need to focus even more on their human, emotional and cognitive capabilities. Why? Because should a client perceive a firm’s consulting tool as the sole mechanism that creates value, they can start to perceive the consulting firm towards the commodity end of the consulting spectrum. This isn’t a race to the bottom that firms would really want to win.